Players whose rankings are not quite high enough for an automatic entry into the main draw of a typical ATP tour event must compete in a couple of extra matches. 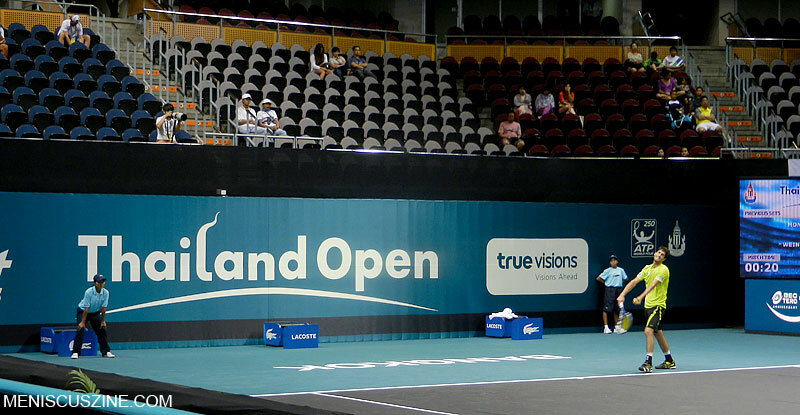 Playing days earlier than the top seeds means taking to a nearly empty court, with the occasional smattering of applause after points mostly overshadowed by silence due to the lack of intercom announcements and spectators. Add those elements to an indoor event, and the echoes of an auditorium-like venue merely amplify the loneliness of the moment. Court 1 offers a more personal view, with an environment closer to that of a recreational club than a formal tournament. It was here that local player Dane Chuntraruk was on the wrong end of a 6-1, 3-6, 6-2 score at the hands of Jui-Chen Hung of Taiwan. Qualifying weekend concludes on Sunday. Following the withdrawal of Wimbledon champion Andy Murray, whose back surgery will end his 2013 season, Tomas Berdych is the top seed at the Thailand Open, followed by defending champion Richard Gasquet. Tickets are available at www.thailandopen.org.